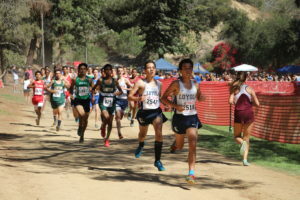 Consisting of freshmen, sophomores, juniors and seniors, the JV cross-country team finished the season undefeated in Mission League with a perfect score of 15 points at league finals on Wednesday, Nov. 2. One of their wins during the season was at the Bell-Jeff Invitational at Griffith Park on Sept. 24. Senior Gavin Pfaffinger placed first in the race with a time of 16:34, leading the Cubs to a first place finish by one point. The Cubs beat Highland High School 44-45, the closest margin of victory for the Cubs throughout the entire season. The Cubs also came in first at the Mt. SAC Invitational on Oct. 22 with three runners in the top 10. With a time of 15:54, junior Liam Jamieson finished first with a decisive 30 second lead over the rest of the field. Placing second, junior Joshua Ma finished in 16:26. Senior Adrian Jauregui finished sixth with a time of 16:36, helping the Cubs win with a 74-77 lead over second place finisher El Toro High School. The Cubs concluded their season at the annual Mission League Finals at Crescenta Valley Park on Nov. 2. In a field comprised of runners from all grade levels and seven different schools, the Cubs swept the top ten places, winning with a perfect score. At the conclusion of the meet, Diaz announced the top five finishers as alternates for the varsity team for the upcoming CIF postseason. In addition to Ratkovich and Ma, sophomores Vinnie Giachini and Roberto Ruelas, who placed third and fourth, respectively, along with Jauregui, who placed fifth, will accompany the top seven varsity runners as the team progresses into postseason racing.